This is the second shirt in my "One pattern - three shirts" series. I call it the shirred front shirt (I know, not very original). Download my pattern here for size Medium or draft a pattern according to my post here. Now you need to make the following alteration on the front. From the bottom of the armhole measure down 1.75 inches and mark. From the top of the neckline measure down 5 inches parallel to your armhole (the distance between the armhole and the line is approximately 3 inches). Mark the end of the line. Now connect the two marks. Mark about half an inch down from your left top point and connect that mark with your mark coming from the neckline. I think it is easier if you just look at the picture and do the same. Cut along all your new lines, so that your front bodice is made of two parts. Now Tape your bottom bodice to a small scrap of paper and mark up 2.5 inches from your top right corner. Draw a line parallel to your now straight neckline all the way across. From your top left corner draw a diagonal line up to meet your new horizontal line. Your Bottom Bodice piece looks like this now. You need to cut all pieces with an extra 1/2 inch seam allowance! Cut one back bodice on the fold. Now cut your bottom front bodice piece on the fold. Your fold is now the diagonal line. Don't be shocked if the bottom of you bodice looks like this. It should work out after the shirring, and if not, you can straighten it out later. Also cut four of your shoulder pieces. You have to fold your fabric and cut two pieces together, so that you have a left and a right shoulder. Now we can start sewing! All seam allowances are 1/2 an inch unless otherwise stated. 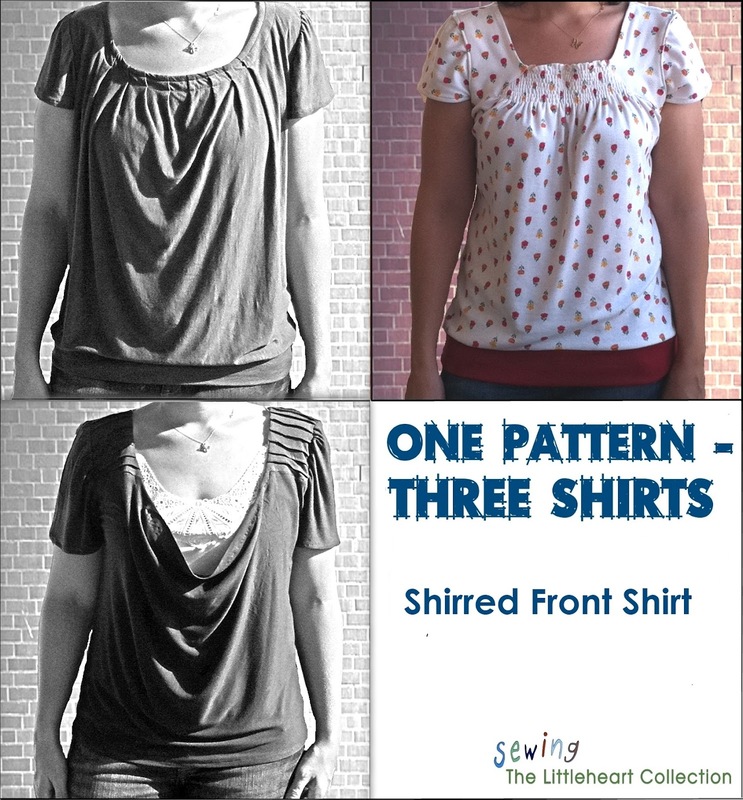 We will start with the shirring part (if you don't know how to shirr, you can find a tutorial here). Fold over the extra 2.5 inches on the top of your front bodice and pin. Don't mind that little cut out triangle. Just fold and make the top as straight as possible. Flip the bodice so that your right side is up. Now shirr across the straight neckline, all the way down that 2.5 inch piece (for my shirt it was exactly one bobbin of elastic thread, 9 lines of shirring). Backstitch in the beginning and the end, and maybe tie your ends together just to be sure. 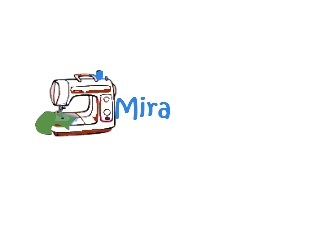 Make sure you steam the shirred part when you are done, so it shrinks to its minimum. Now sew together your shoulder parts. You will place the two parts, right sides together and pin along all sides except for the bottom (where the shoulder connects to the bodice, the long diagonal line). Sew all the pinned sides, clip the corners, turn over and press. Do this for both shoulder pieces. Now pin the shoulder piece to the bodice piece, matching up the diagonal sides. At the top, where the shirring is, you need to pin inward a bit, so that your diagonal line keeps on going (see picture – I marked it with a circle). Your shoulder might be a bit smaller than your bodice, so you can stretch it a bit as you pin. Sew across the diagonal line, starting at the shirred end of the bodice. Topstitch across the same line (on the shoulder part), folding your seam towards the shoulder. Clip off that access shirring corner. 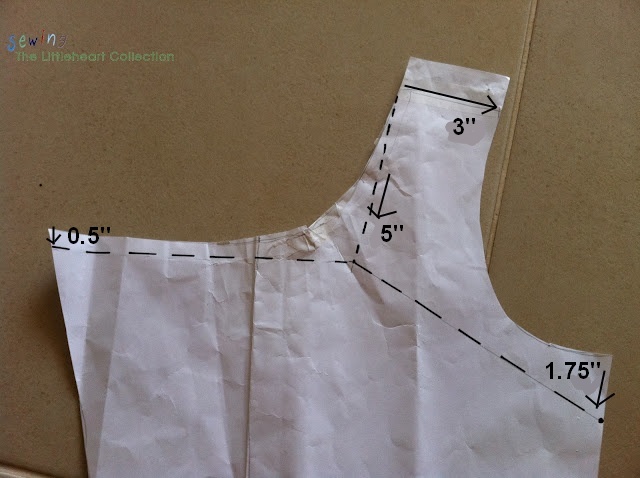 Now take your back bodice and fold over the neckline twice (1/4 inch). Sew along the neckline. Lay your top flat and straighten out the bottom, cutting off any extra material. Sew on sleeves. I used the Half sleeve option for this top. Hem bottom or put on band: Cut two long strips of your knit fabric, 4 inches shorter than the width of your bodice. Make them about 6 inches wide. Sew them right sides together on the short sides. You should now have a loop. Fold your loop in half and press. Now line your loop up with the bottom of your shirt, raw edges together and sew along the entire hem (half an inch seam allowance). Flip the band down and press. Put on your shirt and show it off! I will be linking up to some of the link parties on this page . I LOVE this version!!! The shirring is so pretty!!! What a cutie you are - your shirts are so awesome! Awesome shirt! Do you think, I can also use regular non-knit cotton fabric?